Mounds Douglass High School "Golden Tornadoes"
Mounds (population 1,117) is located in far southern Illinois in south central Pulaski County. Mounds is about 5 miles north of Cairo, 2 1/2 miles northwest of the Ohio River, and 3 miles northeast of the Mississippi River. Old Highway 51 is the main roadway traveling through town and Interstate Highway 57 runs past the east edge of town. The Illinois Central Gulf Railroad runs past the west side of town as well. The history of the town of Mounds and its former Douglass High School are in need of research. 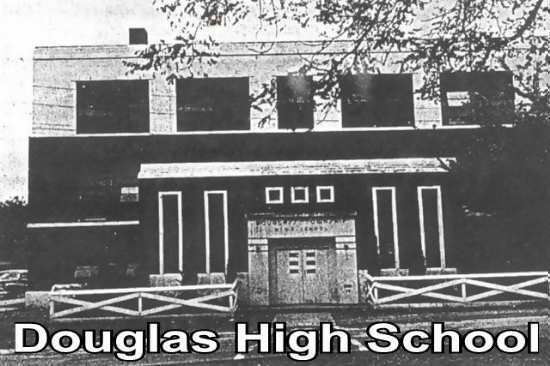 It is quite possible that Mounds Douglass was an all African American high school developed in the early 1900s. There were several similar high schools in the area at the time including schools in Cairo, Colp, Mound City, Brookport, Metropolis, Carbondale, East St. Louis, and Du Quoin Lincoln (also on this site). Schools in these towns made up what was known as the "Southern Illinois Colored Schools Conference." Mounds Douglas was one of the most competitive of these schools, gaining IHSA hardware (www.ihsa.org) in a couple of different sports. At the end of the 1964 school year, it was decided to pool the resources of Mounds High school and Mounds Douglass High School. The nearby town of Mound CIty joined in the effort with Mound CIty High School and Mound CIty Lovejoy High School. The two towns and their four schools made up what is now known as Mounds Meridian High School. Meridian High School and grade school is located in Mounds. We are not sure of the fate of the former Douglass High School building. The photo above was found on the website for Mounds Township High School found at www.MoundsRailroaders.com. The website shows some great historical photos of Mounds, Illinois and was provided to us by Margaret Grace. Douglas HS team nickname: the "Golden Tornadoes"
Mounds Douglass had IHSA success in three different sports (www.ihsa.org). Boys basketball, cross country, and track & field all saw an "area" measure of success. Two kids on the track team even took their success to a state-wide level. The school even won hardware as a member of the Southern Illinois Conference of Colored High Schools (SICCHS). As you can see in the "quick facts" portion, we are in need of a lot of information about Douglass High. Team colors, school fight song, and history of the school and its athletic program are all in need of research. The schools most successful venture was in the sport of basketball. Seven District titles, including an incredible five in a row (1951-55), and two Regional titles highlighted the Douglass HS hardwood lore, to go along with two SICCHS titles during World War II. Unfortunately, the coaches' names and team records of these and other great Douglass High School teams are not available at this time. Several scores from Mounds Douglass participating int he IHSA State Tourney were located on a website titled "Illinois High School Postseason Basketball Scores." The most relevant scores are listed below. The first year that the African American high schools were allowed to compete in the IHSA State Basketball Tourney was in 1945-46. CARRIER MILLS (45): Fort 18, Pritchett 12, Miller 10, Gilchrist 3, Osburn 2. MARION (75): Buckner 23, Hill 22, Riddle 16, B. Connell 6, J. Connell 3, Harris 3, Lingle 2. MOUNDS DOUGLASS (50): Harris 22, Ellis 21, Bailey 3, Watkins 2, Higgenbotham 2. MOUNDS DOUGLASS (80): King 20, Morris 20, Shelby 11, Lowery 8, Chaney 8, Branch 7, Cattledge 2, Hughes 2, Wade 1, Watkins 1. VIENNA (74): Walters 23, Shoemaker 14, Settlemoir 13, Powell 9, Cavitt 6, Wells 4, Hacker 3, Taylor 2. ANNA-JONESBORO (90): Coffman 33, Meyer 21, Bittle 16, Sauerbrunn 13, Jobe 7. MOUNDS DOUGLASS (55): Morris 16, Branch 9, Wade 8, Le. Morris 6, Lowery 6, Hughes 4, Chaney 4, E. Humphries 2. MOUNDS DOUGLASS (77): Beckom 23, Childress 22, Madison 13, Clark 10, Smith 8, King 1. CAIRO SUMNER (74): Wood 24, Solomon 15, Ferguson 15, Rush 11, White 7, Patton 2. WEST FRANKFORT (71): Brown 17, Weaver 15, Manis 12, Pike 12, Burton 8, Wilkinson 7. MOUNDS DOUGLASS (69): Childress 25, Beckom 17, Clark 10, Smith 8, Madison 7, King 2. West Frankfort would finish 3RD in the IHSA Tourney finals. *Coach Gene Cross played basketball and was a star player for Mounds Douglass High School in 1944. He would go on to become the assistant coach for Jim Byassee when Mounds Douglass and Mounds High School merged in 1964. Coach Cross would leave his mark on the Illinois high school coaching circles being elected to the Illinois High School Coaches Hall of Fame. Sadly, Coach Cross passed away in the 2002. Two harrier teams of the mid-1950's proved what a talented lot of athletes Douglass High School had. In consecutive seasons of 1954 and 1955 the cross country boys team won their District Championships and qualified for the state meet competition. Again, coaches' names and team records are not available. Three District titles and two individual medalists marked the IHSA success of the Douglass High School track program. This was done under the one-class track meet system. Their accomplishments are listed below. "I visited your site "Douglass High School...Golden Tornadoes." A wonderful walk down memory lane! Thank you very much. I was a student at Douglass..entering the freshman class of 1947 and graduating with the senior class of 1951. James Price was the Principal through my junior year, as I remember. He resigned at the end of that term....and was replaced by Johnny Edmonds. The faculty was composed of Maude Hill, Mrs. Williams, Stevetta Harrell, Stanley Thomas, and during my senior year a young man joined the staff...his name eludes me. As an aside, around 1981 or perhaps 1982 I was grocery shopping in Safeway at Fairfax Ave/Pico Blvd - Los Angeles. I heard a voice yell from the far side of the store...."Hey Jimmie Earley." It was Mr. Edmonds! I had not seen the man in ages.He had been with the Los Angeles School system for quite a long time! In closing...please visit the PoemHunter link below...read "Mr. Price...the principal." This is a true story! "Stanley F. Thomas, renowned musician and band director, died earlier today, November 4. The band, especially the combo band, was a standout under his direction. He took hand-me-down instruments and worked his magic, and his students so impressed listeners wherever they went that donors showered the school with replacement instruments. I was one of those students, and will never forget, nor betray, his demand for excellence." "I found your website amd noticed information missing in regards to Douglass High School in Mounds, IL. My grandmother and grandfather were both graduates from that school and attend an annual high school reunion every summer. The school colors were purple and gold and my grandmother can still remember her school song. If you would like any addition information please do not hesitate to ask. It was a very prominate school in that era and I would like it to be remembered in any way possible."